27 Boxes We Reviewed For The First Time in May! About this box: The JoJo Siwa Box is a quarterly subscription box that contains exclusive, limited edition JoJo Siwa products with a $60 + value. They offer a quarterly plan for $30 per month + shipping or an annual plan for $27 per month + shipping (you are billed for all 4 boxes at signup). About this box: Baby Gap just released a new subscription: their BedtimeBox! Receive three comfy sleep sets in the softest cotton. Delivered every three months. In 6M–5T. About this box: Enchantment Box is a 100% vegan and cruelty-free subscription box that bills themselves as “ the subscription box for women that believe in magic.” Expect goodies you can use to pamper yourself like makeup, bubble bath, paper goods, crystals, candles, sweet treats, and jewelry. Coupon: Use code Enchanted10 to save 10% off your first box! About this box: Culture Carton is a monthly lifestyle box for men. Each month you’ll receive curated lifestyle items and literature to enhance your gentlemanly status. The Cost: Culture Carton has three subscription options: Essential (just the lifestyle items for $35 a month), Standard (lifestyle items and book for $45 a month), Book Club (monthly book shipped to you for $16 a month). Read our first review to learn more! This box was reviewed by popular demand! About this box: IT’S BY U is a DIY flower arranging kit subscription service. They send the vase style of your choice along with flower arranging tools in your first shipment followed by new flowers and custom instructions weekly, bi-monthly, or monthly. About this box: Baby Booth Box is a monthly photo shoot for your baby in a box. For $40 per month + free shipping you will be sent accessories and props for babies 12 months and under that are related to a different theme as well as a free milestone blanket ($19.99 value in the first box only) and a gift for mom! The Cost:$33.24/ month (delivered every other month) for a recurring subscription or $34.99 for a one time purchase. Shipping is $5.00. Puracy Home Essentials is a line of premium household products specially developed by our team of Ph.D. chemists. Each formula is made from plants, minerals, and natural fragrances. Our products are guaranteed to be effective, and may be safely used around children, pets and your family. Since our products are natural, they contain renewable ingredients that safely break down in the environment. We pride ourselves in having formulations that are pure and free from any harsh chemicals, petroleum, or animal-based ingredients. Our entire line is proudly made in the USA. About this box: SCOUTbox is a monthly subscription service built specifically for scouts, by scouts. Their goal is to provide quality gear and educational materials to enhance scouting at all levels for boys, girls, and adults. Coupon: Use code SCOUTOFTHEBOX to save $8.88 off your first box! About this box: Darn Good Beads of the Month is a monthly subscription for jewelry makers from Darn Good Yarn. (You don’t have to be able to knit or crochet for this subscription!) Every month you’ll receive materials to complete a quick beading project. You will need some basic tools of your own (pliers, crimping pliers, glue) but they provide all the findings, beads, and stringing materials! Read our first review to learn more! This box was being reviewed thanks to an MSA reader request! About this box: Darn Good Yarn of the Month is an affordable subscription box from Darn Good Yarn. For only $10/month, you’ll receive a skein of premium yarn, a pattern, and a free gift. About this box: UrbaneBox is a monthly clothing and accessory subscription box. Each box includes 2-3 pieces picked for you by a stylist. The items are yours to keep. When you sign up, you’ll take a style quiz and give your sizing preferences. Each month, this box will feature 3 new exclusive designs, only available to subscribers. You will be able to log in and select your preference of either leather, gemstone, or metal color options. This information will be used to create customized jewelry just for you in a design and color you are sure to love! The Cost: $64.99 a month + free US shipping. Save with longer subscriptions. The Cost: $47.99/month + $7.00 US shipping. Save with longer subscriptions. About this box: Oxford Momma is a monthly subscription box for moms that’s all about self-care for moms of all ages. Regardless if you’re pregnant or an empty nester, this box is lovingly curated by Tiffany Barry, best known for her Mom Goes Mental blog. In addition to being the mother of 3 daughters, Tiffany is a mental health advocate, a former early childhood educator, and published freelance writer. About this box: Karv is a subscription service delivering the finest-quality U.S. meats and oven-ready entrees straight to your door, every month. The Cost: The boxes come in eight sizes: the 1 Person Plan for $99/month, 2 Person Plan for $179/month, 3 Person Plan for $269/month, 4 Person Plan for $349/month, 5 Person Plan for $439/month, 6 Person Plan for $519/month, 7 Person Plan for $599/month, and 8 Person Plan for $679/month. All the options include free worldwide shipping. Coupon: New subscribers, use code KARVLOVESDADS to get a free 2 person plan ($179 value) and 20%off their first delivery. About this box: Scribbler is a monthly subscription box for writers—specifically, novelists and aspiring novelists—created by authors Victoria Scott and Lindsay Cummings. It’s filled with items to help facilitate improvement and reach publishing goals, as well as some fun writing-themed goodies. About this box: Ahhh Sugar Sugar is a bath and body product company that also offers a subscription box! Each month you can expect 3-4 small batch, handcrafted items, many of which brand new to the brand or exclusive to the box. THE MAKER’S BOX IS YOUR CHANCE TO CONNECT WITH A HAITI DESIGN CO ARTISAN, HEAR THEIR STORY, AND RECEIVE A THOUGHTFULLY MADE PRODUCT DIRECT FROM THEIR STUDIO. WE RELEASE A NEW MAKER’S BOX FOUR TIMES A YEAR—ONE FOR EACH SEASON. YOU CAN PURCHASE AN INDIVIDUAL MAKER’S BOX, OR YOU CAN ORDER AN ANNUAL SUBSCRIPTION TO GET THE LATEST BOX DELIVERED STRAIGHT TO YOUR DOOR! The Cost: $59.00 per season + $16.00 US shipping. Save with longer commitments. Read our first review to learn more! This box is being reviewed thanks to an MSA reader request! About this box: Family Reading Crate is a book box designed with the whole family in mind. Each month you will get about 4 books based on a common theme and one of these will be hand-picked just for the adult in the family. You will also receive a booklet with discussion questions and a few items that tie into the books including collectible bookmarks. This is offered through Build Your Library a secular literature-based homeschool curriculum website. About this box: Kids Dinosaur of the Month Club is a monthly subscription box that sends you a Dino Box each month featuring a different dinosaur. For $19.95 per month + shipping, you will receive a book about the featured dinosaur, a dinosaur toy, a Dino card featuring pictures and information, activity books and a letter from club president, Ptyler the Pterodactyl. You will also receive a personalized membership certificate in your first box. About this box: The Why and Whale Monthly Surprise Pack is a subscription box for children ages 6 months to 6 years filled with 3-6 items such as apparel, toys, and books. 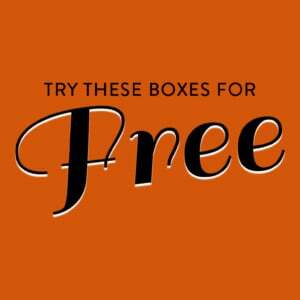 Each month you will get something to wear, something to play with and something to try valued at over $59 per box. Boxes are specific to your child’s age and gender and items are handpicked for the right age development. The Cost: $59 per month + shipping. Save with longer subscriptions. About this box: Mother Snacker is a monthly dessert discovery box designed for mamas who need and deserve a Mother Snack’n break. For $49/month + free shipping you will receive 5-7 full sized artisanal treats and goods curated just for moms. Their mission is simple: moms supporting moms. They do this by donating 1% of their profits to non-profit organizations that support mothers and children as well as through the products they choose. The Cost: $45 a month + shipping. Save with longer subscriptions. Coupon: Use code NEUROFOUNDER10 to save 10% off your first box! About this box: My Fashion Crate is a monthly subscription box for fashionistas. They offer two different subscription options: the Essentials box which includes 3-4 items for $35/month with a value up to $200 and the Premium box which includes 5-8 items for $49.95/month with a value up to $300. Each box contains items for women such as shirts, dresses, accessories and gift cards. When you sign up they will ask for your shirt, bottom, and shoe size. As of now shirts only come in small, medium and large while bottoms go from size 0-18. Coupon: Check out the Free Gift with Purchase Page for all offers! Is it Godiva or Karv for 16? Deep Readers Club is another box we reviewed for the first time in May!